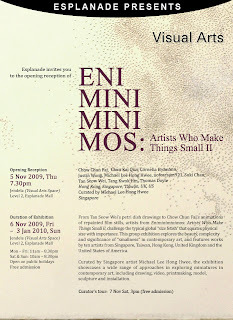 Artists from Eniminiminimos: Artists Who Make Things Small II, beg to differ from this current size bias. This group exhibition explores the beauty, complexity and significance of ‘small size’ in contemporary art, and features contemporary miniatures by about 8 international artists from Singapore, Hong Kong and various cities in the United Kingdom and the United States of America. This exhibition will show that making, using and being small have important implications in art and life. Curated by Singapore artist Michael Lee Hong Hwee, the exhibition showcases a wide range of approaches in exploring miniatures in contemporary art, including drawing, painting, video, printmaking, photography, model, sculpture and installation.